Can Canadians Play at Full Tilt Poker for Real Money? No - Full Tilt Poker is Shut Down in Canada Like The rest of the world. Full tilt Poker has lost its gaming licence following events in the USA. There are rumours that a group of European investors is going to buy Full Tilt Poker / and that Full Tilt will be licensed in Kahnawake Canada and reopen soon. At this time we do not recommend trying to play at Full Tilt until these matters are resolved. Visit our homepage for the top 5 most reputable sites for Canadians to play poker online. The Full Tilt Bonus for new accounts is 100% deposit match up to $600 - use Full Tilt referral code COOTER and get the maximum bonus for Canadian players. The Full Tilt Bonus is the easiest bonus to clear online with more bonus released per dollar of rake generated than any other poker site. Full Tilt Poker software is one of the best online and is a new version that was released in 2009. The software has many filters and usability features including full video hand replays, resizable multi-tabling, tournament and cash game filters. Rush poker is another advancement that allows you to play hands as fast as you want and then you are transferred immediately to another table to play another hand. The software shows how fast it can operate in this environment with up to 400 poker hands per hour. Full Tilt poker promotions include multiple chances to play against poker pros in all kinds of sit n gos and Multi Table tournaments. Some cash games against pros are also featured at lower levels. The loyalty program is good and is based on frequent player points like at other online poker sites but not the most lucrative. Reload bonuses are offered and usually if your bankroll runs low or if you have not played in a while you will receive a notification that you are eligible for the promotion. The Full Tilt sign up bonus is good at 100% up to $600 for new accounts. Customer support is quick and professional at Full Tilt and is available 24/7. Customer support is offered via e-mail only and support times very between 5 -35 minutes. the quality of responses shows knowledgeable professional support staff. Texas Hold em Limit and No Limit; Omaha, Omaha Hi-lo; 7 card Stud, 7 card Stud Hi Lo, Razz and Horse are offered and all are well trafficked. Competition at games other than Hold em is somewhat weaker. Rush poker is a big draw at Full Tilt Poker and allows you to play a ton of poker hands in a very short time. 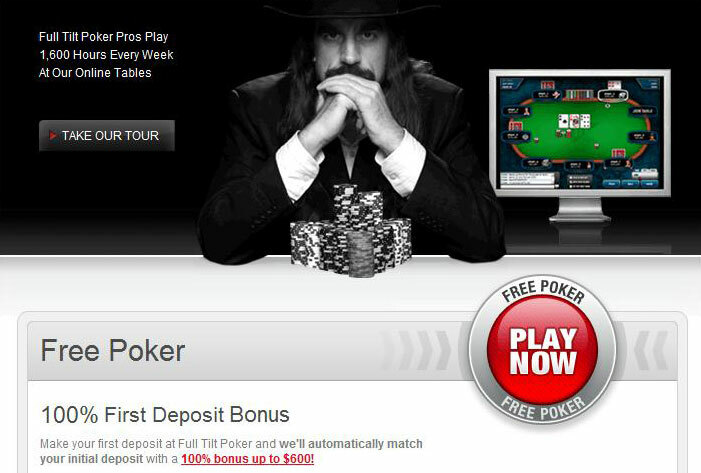 The Canada Cup of online poker is played at Full Tilt Poker. Full Tilt offers the second best (after PokerStars) number of tournaments and million dollar guaranteed tournaments every week. Daily there are so many tournaments to play in and many with good guarantees that you are never in want of more selection. Full Tilt Poker is its own independent poker network and has the second highest number of players online after PokerStars. Full Tilt has had rapid growth over the last 5 years and is second in Growth to PKR. Traffic levels are good 24/7 with more fish at peak hours around 6:00 - 8:00pm EST. Tournament traffic is very good as well. Competition at Full Tilt Poker is much tougher than at other poker sites and it is well known for its tight players. Tight players don't necessarily mean good players and there are many weak tight players online here. When you play poker online at Full Tilt there are a lot of sharks and fish but there are many more sharks at the higher levels. Full Tilt does have the biggest cash games online. With the number of high profile pros that play here and tougher competition along with the Full Tilt Academy, Full Tilt is the best place to learn how to play poker well.